Feature afford price with energy-saving. Save 90% energy compared with HPS/HID. Beat HPS/HID and traditional LED Light. Covers a full 2' x 2'/4' x 4' , easily replace a 300W/600W HPS or HID. While consuming 100/200 watts of actual power. Suitable for 100100180cm/120120200cm grow tent(not included). Less heat release than other general grow light led's 1/3. High Par Value and High Lumen, Minimum Heat, Maximum Growth. High par value(photosynthetically active radiation)ensured high light absorption of plants to maximize the plant growth and harvest. Higher lumen and long lifespan ensured. Special ratios of Blue/Red/White Spectrum which. 10 years of research and testing. Can be fully absorbed by the plant to photosynthesis, Best for fast growth and high yield and make sure a high THC in harvest. Upgraded New generation PVC-steel Frame. Lighter than other general led grow light panels, against friction, pressure. High compressive strength and compression strength. Quality Parts-Not Jelly Bulit, Safe to use! Light pass Strict quality standard. ETL, UL, CE, RoHS, SAA, PSE cetificate. Stronger hanging kits are available for easy installation. 100% Safe to use, zero risk! No worry of fire or security threat, long-life. 1 Seeding / Breeding/ Veg/ Flower/For all planting stages / Green Vegs / Flower Plant / Fruit Plant / Herbs / Medical / Meat Plant etc. 2 Hydroponics / Horticulture / Indoor plants / Greenhouse Lighting / Pot Culture / Farm / Water Soluble Breeding / Pipeline Cultivation etc. 3 Exhibition / House Garden / Bonsai / Home / Commercial Crops / Project / Personal Growing / Urban and University Research ect. Product Model:500W LED Grow Light. As the high cost-effective light in the market, come with. New upgraded Epistar LED chips. Full spectrum, intense penetrate, lower heat release, clear internal setting. Complete cooling system with fans and heatsink. Easy to set, low use cost, can work with timer to control working time. (Most Appropariate light proportion for increasing the yields of Commericial cultivation)Use for all stages of plant growth and Bloom. High efficiency 5W Epistar (HI-LED) High Intensity. Power Consumption for each Unit: 110V: 278W±10%, 220V: 272W±10%. Amp: 2.49A/110v; 1.23A/220v. Product Dimensions(L/W/H): 11.81''x8.27''x2.36''=30x21x6 cm. Recommend Coverage Area for Per Unit. 3'x2.5'=92x76cm(Veg). 2.5'x2'=76x60cm (Bloom). Max Coverage at 24 Height for Per Unit. Cetification: ETL, UL, RoHs, CE, SAA, PSE, 100% Safe guaranteed! Lens View Angle: 90°/120° Mixed. Net Weight: 2.23lbs/1.01KG. Product Model:1000W LED Grow Light. Power Consumption for each Unit: 110V: 552W±5%, 220V: 541W±5%. Amp: 110V: 4.44A, 220V: 2.43A. 4.5'×4.5'=137×137 cm(Veg). 4'×4'=122×122 cm(Bloom). Net Weight: 2.71lbs/1.226KG. 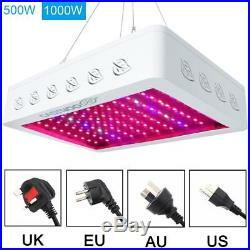 1 x Upgraded CASTNOO 500W or 1000W LED Grow Light for Veg Flower. 1 x Free Power cord with Plug. 1 set Free Strong Steel hanging kits. (Retail item will be sent according to your choice). How do I determine the right light for my grow area? Multiply the length times the width and this will give you the square footage. You should be able to get decent results with 30-50 actual watts of power per square foot. For larger areas should I go with a single large panel or multiple medium to small lights? Using multiple lights allows you to better distribute the intense light in more areas of the grow space instead of having all of the higher intensity light concentrated in only one area while the outer edges never receive intense light. The light is not water-proof, so do not use it under water environment. Light may be too strong, please wear your sunglasses when looking at it. Human eye can not see IR very clearly, but you can wear sunglasses to check. The images are for reference only. Please take the item you get as the standard. We maintain high standards of excellence. Feedback is very important to us. Feedback, so that we can satisfactorily address your concerns. It is impossible to address issues if we do not know about them! Our office hours are : - 9:00 a. (GMT +8) of Monday to Friday - 9:00 a. (GMT +8) of Saturday And our office is closed on Sunday and public holidays (Hong Kong) We apologize for the late reply during the holidays. High Par Value and High Lumen, Minimum Heat, Maximum Growth High par value(photosynthetically active radiation)ensured high light absorption of plants to maximize the plant growth and harvest. Special ratios of Blue/Red/White Spectrum which based on 10 years of research and testing can be fully absorbed by the plant to photosynthesis, Best for fast growth and high yield and make sure a high THC in harvest. Lighter than other general led grow light panels, against friction, pressure , with long service life. Feature: As the high cost-effective light in the market, come with. White , 430440nm, 450475nm, 620630nm, 650670nm. LED Diode Quantity : 100 pcs LED Brand : High efficiency 5W Epistar (HI-LED) High Intensity Power Consumption for each Unit: 110V: 278W±10%, 220V: 272W±10% Amp: 2.49A/110v; 1.23A/220v Replaces HPS/HID/MH: 300 watt Suitable Voltage: AC85265V Par at 18: 980mols Lumen: 12630 LM Noise Level: 56 DB Product Dimensions(L/W/H): 11.81''x8.27''x2.36''=30x21x6 cm Recommend Coverage Area for Per Unit : 3'x2.5'=92x76cm(Veg). LED Diode Quantity : 200 pcs LED Brand : High efficiency 5W Epistar (HI-LED) High Intensity Power Consumption for each Unit: 110V: 552W±5%, 220V: 541W±5%. Replaces HPS/HID/MH: 600 watt Suitable Voltage: AC85265V Par at 18: 1644mols Lumen: 13610 LM Noise Level: 60 DB Product Dimensions(L/W/H): 11.81''x8.27''x2.36''=30x21x6 cm Recommend Coverage Area for Per Unit : 4.5'×4.5'=137×137 cm(Veg). Recommend Coverage Area for Per Unit: 4'×4'=122×122 cm(Bloom). Max Coverage at 24 Height for Per Unit: 5x5ft=152x152cm. Operating Temperature: -4545(-49113) Lens View Angle: 90°/120° Mixed Net Weight: 2.71lbs/1.226KG Lifespan: 50,000-100,000hours. 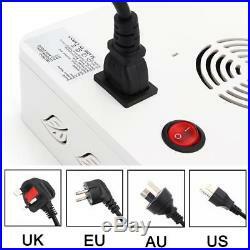 1 x Free Power cord with Plug(US/UK/AU/EU plug). The item "1000W 500W Watt LED Grow Light Lamp Plant Flower Oganic Growing Full Spectrum UP" is in sale since Wednesday, June 6, 2018. This item is in the category "Home & Garden\Yard, Garden & Outdoor Living\Gardening Supplies\Hydroponics & Seed Starting\Grow Light Kits". The seller is "up-memory88" and is located in Hong Kong. This item can be shipped worldwide.